I just love it when my friends share pictures of the items I made for them. 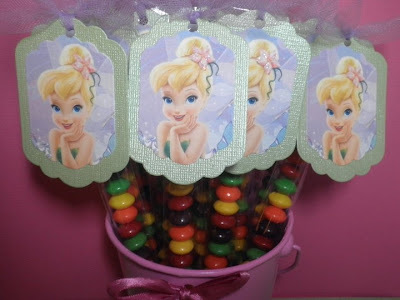 Here are some pictures of Tinkerbell party items that I made. These boxes believe it or not are actually from Sweet Treats cricut cartridge. I then cut a 10x2.2 strip of paper out and border punched the sides then glued it to the box to be used as a handle. I think these just came out perfect!! For those of you who have the Tinkerbell cartridge you will forgive me for not cutting her out for all these items especially since she would of been very small making her eyes and lips even smaller! Instead I used clip art and my spellbinders to cut her out in a circle. Here is a close up of the sticks standing up.. When those little girls walked into that room, they must have been so excited. This is just fabulous. Wow! this is awesome. I want to have my party decked out like this! TFS very beautiful! I bet the girls loved the party!! You are the birthday party Queen!! Love your work. Boy, you made a lot of little girls happy!! I bet that party was every girls dream! I am sure she had a happy mom too! Great job! I love the "Tink" Birthday, just beautiful, thank you for sharing. I have a soon to be 7 year old granddaughter who would just love this. Did you print out "Tink" on your home printer? If so what printer do you have? Make/Model. Again thanks for sharing. PS I am kind of a neighbor, I live in Valley Springs. I love how everything came up. Thanks for sharing... I also have a question if you dont mind what type of printer and paper you used for your clip art?? ?